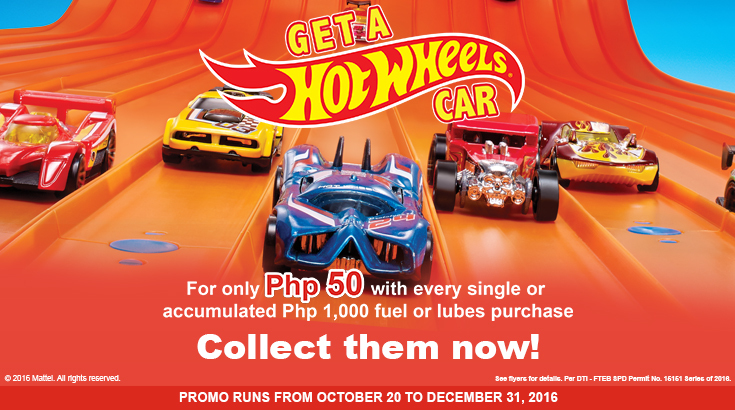 Fuel up at selected Phoenix Petroleum stations nationwide from October 20 to December 31, 2016, and get a chance to collect up to 100 Hot Wheels toy car designs in the Get A Hot Wheels Car Promo. Every P1,000 single or accumulated purchase of Phoenix fuel or lubricants entitles you to purchase one Hot Wheels diecast toy car for only P50. Just present your receipt/s to a forecourt attendant to avail of the promo. Promo is applicable for cash and credit card fuel and lubes transactions. Receipt/s for accumulation must be within the promo period, and can only be used once. Any excess amount on the receipt/s shall be void and cannot be used in the next toy car purchase. Receipts are valid only at the branch where the transaction was made. The Hot Wheels car may be purchased up to 60 days from end of the promo period. Hot Wheels is the number one vehicle toy brand in the world with around 400 designs and 10.5 cars sold every second.